Education (School) Department, Tripura Recruitment 2017- 12000 Nos. Academic Counsellor, Library Assistant, Hostel Warden & Other Posts. - Jobs4NE : Jobs in Assam and North East India. 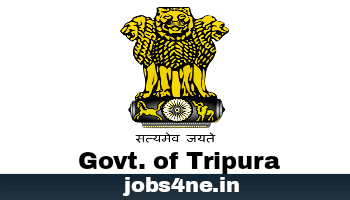 Education (School) Department, Tripura Recruitment 2017- 12000 Nos. Academic Counsellor, Library Assistant, Hostel Warden & Other Posts. Applications as per format enclosed are invited from eligible Indian nationals permanently residing in Tripura for consideration of appointment to the following category of posts on monthly fixed pay and on purely temporary basis under the Directorate of Secondary Education/ Directorate of Elementary Education, Government of Tripura. Total no. of posts: 12000 Nos. Qualification: Minimum Honours/ Post Graduate Degree from any recognized University with at least 5 (five) years teaching experience in any Govt./Govt recognized High or H.S Schools. Preference will be given to the candidates having minimum 3 years experience in education counselling in any Govt./Govt. recognized High & H.S Schools. Qualification: Minimum Graduate degree from any recognized University with at least 5(five) years teaching experience in any Govt./Govt recognized Schools. Preference will be given to the candidates having 3 years experience in education counselling in any Govt./Govt. recognized Schools. Qualification: Minimum graduate degree from any recognized University with at least 5(five) years experience in supervision or handling of books of library in any Govt./Govt. recognized Schools. Preference will be given to candidates having diploma in Library Science with three years experience in any Govt./Govt. recognized Schools. Qualification: Minimum Graduate Degree from any recognized University with at least 5(five) years teaching or administrative experience in schools/ Hostels in any Govt./Govt. recognized Schools. Qualification: Madhyamik or its equivalent examination passed from any recognized Board/Institution with 3 years experience in functioning and maintenance of school administration in any govt./ govt. recognised schools. Preference will be given to the candidates having 3 years experience in providing or supervising mid-day meal related works in schools. Age Limit: 21- 45 years. How to Apply: The applications should be addressed to the Director of Secondary Education, Government of Tripura, Agartala in respect of posts Sl.no.1 to 4 and to the Director of Elementary Education, Government of Tripura, Agartala in respect of Sl.no.5 and submitted to the respective District Education Offices of the District to which the candidates belong to, on all working days from 11-00 am. to 4-00 p.m. within 10th July,2017. A candidate should submit application to the receiving centre of his/her District as per his/her permanent address.